On most Friday’s, Nancy plays bridge in Palm Coast with a semi-regular partner, Joanne. Joanne was recently diagnosed with some kind of cancer and is undergoing a combination of radiation and chemo – as it happens, on Friday mornings. This past Friday was the first day of her treatments and the arrangement was that she would still play bridge that afternoon unless Nancy heard from her to the contrary by 11:30AM. She didn’t so we headed over and I dropped her off at the game about 12:30 and then went surf fishing. Joanne never showed up but Nancy picked up another player for the day. When I came back at 4:30 she said they had a good game and that was that. They post the results on line a few hours after the game and Nancy learned that she came in first in “A” and first overall. The icing on the cake was that this day happened to be the club championship game and she ended up winning the championship. The “A” signifies the level of the player in terms of master points. Nancy is a “C” so it’s surprising (not to me) when she ends up ahead of the life masters and other “A” players, of which there are plenty in this club. Congrat’s Nance (champ). We went to a reunion of folks who worked for General Dynamics in the 60’s and 70’s. We missed the last reunion two years ago when I was having some debilitating medical procedures so it’s been 5 years since seeing most of the folks. Some guys showed up who I haven’t seen in 40 years. I really enjoyed seeing and mingling with all of them. Of course they’ve all gotten old and I’m guessing probably 50% of the folks have passed on to the happy hunting ground. The wild life is getting closer and closer. I see deer tracks almost every day now in the garden. 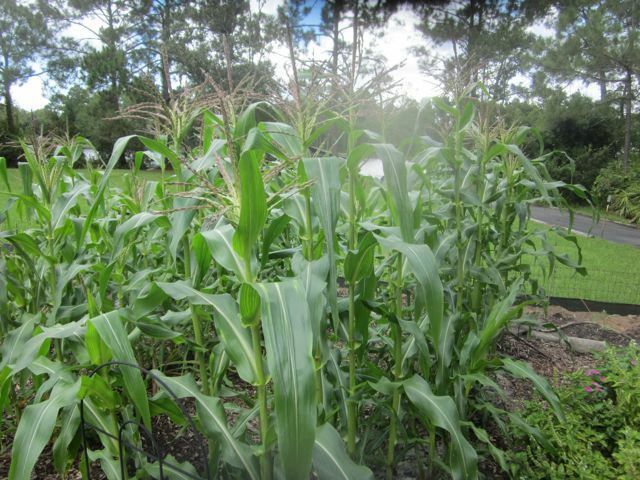 So far they’ve eaten very little but I suspect when the corn ripens, that will change. My guess is the reason they are coming is to scout out the corn status. I haven’t seen any bears but my neighbor, Andrew, reports almost nightly visits. The other night he opened his door and found himself about 10’ from two. When we come home after dark now, we park at the house instead of the carport to eliminate a 100’ walk in the jungle. Of course I’d take the chance but my bride has no interest in an up close and personal meeting. As the hurricane seasons comes to a close, The message that should come across loud and clear is that the climatologists don’t have a clue what’s coming in the future. In April the prediction was for a more active than normal season in terms of number of storms, intensity of storms and where those storms would generally hit. They reduced the numbers in July but still missed by a mile. I’m ok with that since I’m not sure what you’re supposed to do with the forecast even if it was accurate but it bothers me that people will take as gospel the predictions these same folks make about global warming. The rhetoric has changed somewhat to “climate change” and I guess we can say with 100% certainty that the climate will change over time and from time to time. With that same level of certainty we can say the temps will rise and they will fall – just not when, for how long, or with what intensity. Anyway, not even a close call on a hurricane anywhere; not on the east coast, not in the Gulf of Mexico – nada. Not even a big storm. I also have to note that this is two years in a row which may be setting some kind of record for inactivity. I guess the hook between warmer ocean temps and storm activity is tenuous at best or maybe the ocean is getting cooler. I mentioned seeing a few baby cucumbers on the vines. What an understatement that turns out to be. There are now dozens of 2” size cucumbers, a couple double that size and one pickable right now. For those who counts such things, that’s 49 days since planting the seeds, 10 days ahead of the supplier’s estimate. Plus the vines are loaded with blossoms. I can see where we’re covered right thru to the first freeze with plenty for shrimp lady and ground beef lady. So between cucumbers, corn, and green beans I don’t think we’re in danger of starving for the next 3 months. I keep trying to get early starts on the winter stuff but it seems to last one or two nights in the garden before something gets them. I plant lots of spare seed so I keep trying until they finally make it. If I was short on seed, I’d wait another month. The weather guys keep saying it’s going to get cooler sooner than usual and I want to be prepared for global cooling. Got into another battle with some unknown critter. A couple of days ago I went out to Nancy’s shed to get something out of the freezer and noticed that something had dug out a major hole to get under the shed. I got the wheel barrow and filled it with what had been dug out and then plugged the hole and pushed it way back under the shed. The next morning it looked exactly the same as before – a den/cave opening. This was way too big for either mice or rats but could be an armadillo, raccoon, or possum. War. I got a solid concrete block about 2’x1’x1’ that weighed close to 40 pounds, plugged the hole, and spread the dirt in front of the shed. I have no doubts they’ll find another place to attack but if it’s not in sight, I can live with it. Oops, spoke too soon, he dug around the block. I have a long position on 30 pound concrete cylinders so I’m going to win this one (probably). I could also run the hose up under there and let it run for an hour or so. Kind of a reverse Noah approach. The dig around is only the tip of the iceberg today. Nancy found that there was a truly gigantic nest of carpenter ants in one of her shed closets. Carpenter ants are fairly large and this was a very impressive swarm of ants and eggs. I got all the bug spray I could find plus the shop vac and went to work. A lot of Utah winter clothes are history and it’ll take a few days to really uncover the full extent of the damage. Luckily these are not as aggressive as fire ants and I was only bitten a couple of times although at one point I think there were dozens crawling on my legs and arms. Then the grill ran out of gas halfway through cooking a chicken- at least I think it was halfway through. Really, really getting tired of all this Ray Rice, domestic violence thing. Nobody’s asking the real question – what did she say before he popped her? It looked to me like she was coming at him in the elevator and this may have been a case of self defense. Only kidding ladies. So much rain. I think we’ve had 8-10” in the past week. Working in the garden is starting to be a muddy event. It’s not the amount of rain but rather that it comes in bursts of really intense rain for an hour then a bit of drizzle after. I’m sure it would be a total disaster if I hadn’t been systematically adding compost for the past 5 years which elevates the garden over local ground level to provide some drainage. One more week like this last one and the lake will be overtop my neighbor’s dock. My neighbor suggested we go over to the Tomoka River and dig for clams in a sandbar we both know about. We had previously scouted out a place where we could put in our kayaks fairly close to the sandbars. I had some concerns about how well George would do in a kayak due to his shortness of breath with any exertion and also his added girth since the last time he tried it. We went anyway and had no difficulty at all getting the boats launched and paddling up to the sandbars. My boat is faster than his so I’d get a little bit ahead and then drift back casting for whatever fish might be swimming in the dark water beneath. When we got to the clam banks, he got out and started finding them right away. I’m really not interested in clams, especially in that part of the river – way upstream from salt water- so I went back to fishing. He probably got 100 clams and I got zero fish – score one for George. We decided to just cruise further upstream and see what there was to see. We went under 95, under 40 and another 3-4 miles north until the river really narrowed and was almost blocked a couple times by fallen trees. Really primitive looking swamp but then occasionally we’d round a bend and there would be a multi multi million dollar spread. A couple of times the turn around a bend exposed a couple of deer. By the time we decided to turn around and head back we were probably 4 -5 miles from the put in place. When we got back to where the river opened up a bit, the wind had picked up a bit and was right in our face. Couple that with the tide change that was against us and I knew getting back would be a bit more strenuous. We had to stop a couple of times for George to catch his breath but we did make it. He was sore for the next couple of days. Me, not so much since I use the kayak quite often – not this much but still I’m more conditioned to kayaking. When he got home, he purged the clams in salt water for a day and then popped them on the grill to open them. His game plan was to convert them all into clam chowder. Turned out they were not all that appetizing and smelled bad. He tried to eat one and immediately threw up so all that work went for nil. I’m taking away the “score one for George”. Catching no fish is better than digging up bad clams. And while Joe is scoring, another repair success. This is getting scary. I was in the recliner the other night and all of a sudden there was a loud pop and a big spring went flying out on the floor from under the chair. I turned it over and found that in addition to the flying spring, another had broken but was still attached on one end. These are heavy metal springs about 5” long and 1” in diameter. Because the one was still attached I could figure out where they were supposed to go. We were heading over to Ormond so I could find replacement springs at Harbor Freight or Lowes – no such luck. My next source was George who had loads of springs but unfortunately none that fit the job. He suggested we try to modify the old spring to create new attachment hooks on both ends. I had my doubts about that but we managed to fashion something resembling attachment points – oila, worked like a world champ. The chair snapped into position like new. I think it had probably been operating on one spring for quite some time. I’m going to quit boring you with corn news. Not. One day after I told you it was 6’ tall and there were tiny ears with silk it was 7’ tall and there were dozens of ears with silk. I don’t remember this happening last spring. Certainly the soil is warmer but also there have been lots and lots of fish carcasses planted before the corn went in so just maybe……………. If the corn has a fishy taste, the link will be established. The next time I mention corn it will be either how good it tastes or that it all crashed. I guess if it hits 10’…………….. Nancy has a bridge partner who’s husband is or was a farmer. He said that if you walk into a cornfield at night, you can actually hear it growing and I believe that. He says that the reason it’s growing like crazy is the high level of moisture. It’s certainly growing faster now than it did in the spring and it’s certainly wetter now so that may be the answer. When the deer nibbled away many of my tomatoes, Nancy took pity on me and stopped by her favorite nursery in Debary and picked up 3x 4 packs of plants. I planted them but had no technical info on the varieties, just tags that named 8 of the plants as Rutgers and 4 as LaRoma. I was totally unfamiliar with either but looked them up on the internet and found some interesting history. I think everybody over the age of 50 would tell you that hands down, Jersey tomatoes are the best tasting ever. That’s all I ever heard growing up. I assumed that Jersey tomatoes were grown only in Jersey and owed their taste to something in the Jersey soil. What I learned was that the reason they were called Jersey tomatoes is because they were developed by Rutgers University, a famous college in New Jersey. For local use and canning they were the best but commercially they had a flaw – too soft to travel. They later made a hybrid which retained the flavor, added some disease protection but not the firmness problem. Now I’m looking forward to this crop and just hope it does well in Florida. The La Roma’s are a paste tomato (which I was fairly certain of before the research) and have good disease and nematode resistance so I have more confidence that these will do ok. So far, after a week in the garden, all the plants are looking good. I had to take another corn picture. It’s now 6’ tall, loaded with tassels and I can start to see on the stalks where the ears will form. Not there yet but discernible to the trained farmer. Update – those bumps on the stalks were literally little ears with silk 6 hours later. I am amazed by how fast this is happening. The other pic is the early cucumbers planted August 1. There are some micro cuc’s forming on the stems so I’m guessing we’ll be picking a few by the 1st of October. I’ve never grown this variety before, Diva, but they have a good resume and I have a row of my reliable Sweet Success two weeks into the cycle. Those will be the Nov crop. I need these to be very productive since Nancy’s bridge partner, the one who trades shrimp for cucumbers, told her that they caught 4000 shrimp this past weekend. These are also the cuc’s that Nancy’s quilting partner, the one who raises cattle, covets. She dropped off 14 pounds of ground beef last week – a down payment for cucumbers, pole beans, and cherry tomatoes. Newly hatched “brassicas” all look alike so it’s very easy to mix up broccoli, cabbage, kale, cauliflower, and kolrabi. and it really gets complicated when you have a few varieties of each. These are my nutribullet main actors. I now have 3 full flats (18 plants per flat), one for Joey, two for us and several four packs for a variety of “customers”. By the end of the week, I’ll have two more flats of lettuce, one for Joey, one for us. One variety of lettuce is red leaf so that one’s easy to keep separate. Also lettuce grows so fast that the leaves differentiate themselves quickly so you can generally keep the varieties separated after a few weeks. Last week the corn was waist high; one week later it’s neck high. I know it grows fast but it amazes me every time I see it happening. Tassels popped out on several stalks on the 5th of Sept – 35 days after planting the seed. 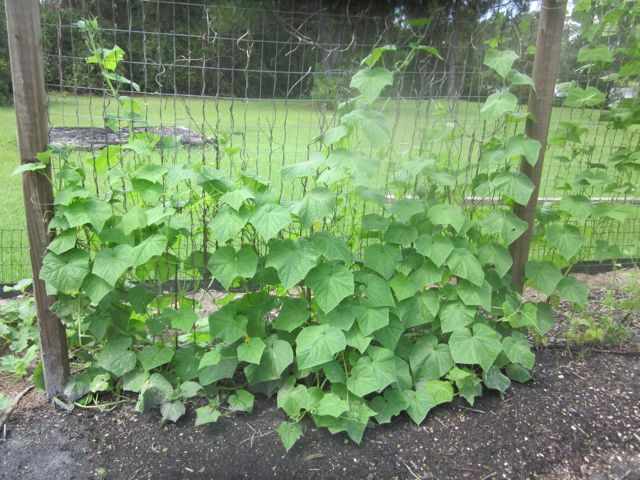 Blossoms on the pole beans – in the spots not trimmed by the deer. Maybe it’s all the rain we’ve had – daily and anywhere between 1/2 and 2”. I planted a dozen tomato plants and 20 “spares” in case I had some fallout. Everything was looking great so I gave away all of the spares – then the deer “browsed” so I went from having tomato plants coming out my ears to none. Nancy stopped by a nursery she frequents and picked up a dozen plants that were way past their prime and root bound. I had thought about it but the one’s in Lowes were trashy and expensive. I wouldn’t have even planted them and they wanted $3.50 per plant. It was a no brainer to pass on them. Nancy got a dozen at her nursery for $5 – worth the risk that they will take hold and grow. It is expensive to feed deer but we really use lots of tomatoes for sauce so it makes sense to give it a try. Chris has a car now and is settling into a regular work routine so the move went as smoothly as can be imagined. He got a low mileage 2013 Ford Fusion, the James Bond, Aston Martin looking model. He now has to switch focus and start planning for his first official guests – Joanne and Nancy. They’re going up in early October for a few days. With both Chris and little Tommy up there, the pull is gravitational. Next comes winter. I very distinctly remember the last time I was in Chicago and also remember saying that was most likely the last time I would ever, ever, ever be back. I have a real dilemma coming up. UCF is going to play Missouri. While Tommy was attending Mizzu and since his graduation, I have cheered for them (except when they played Florida). Since Tom, and now Olivia, became associated with UCF, I cheer for them (with the same Florida exclusion) but this game will break new ground. True, Mizzu is an SEC team but it feels like the tie breaker should be the fact that Olivia is a current student, Tom is both a student and an employee at UCF whereas Tommy is a graduate – alumnus. Sorry Tommy. This airplane reclining seat problem is getting quite serious. I’m thinking Obama should add this to his list of action items. This is one he can probably sink his teeth into and regain lost credibility. It was embarrassing to see him sitting at a round conference table with the European leaders being the dominant players. Normally I’m super ready for the college football season but not so sure this year. UCF lost one in the last second and now that Olivia is associated with them, I feel obligated to follow them. Florida’s opener was washed out so the big question mark is still out there. Not sure I could personally survive another 4 and 8 season – I’m sure the coach can’t. Last year they added the offensive coach from Boise State which has fielded one the best offenses in the country. He’s history. This season they’ve replaced him with the offensive coach from Duke. Duke? Offense?? Stetson won their opener so maybe I should concentrate on the locals and not get caught up in all the hoopla. Now that the major colleges will be hiring players, this could just be the right time to make the break on general principles. I started a fair sized project to recover my green house. I bought a small, 8’x8’x6’, a few years ago and got alot of use out of it for 2 years. Then the sun just ate away the plastic covering so there was no weather protection at all. I had quite a lot of potting materials, tools, containers and all the things you use to start seedlings and do transplanting and a year in the weather basically destroyed it all. So I cleaned it up, threw away the junk, and recovered it with 6 mil plastic. That may possibly hold up a year or two but for sure it should get me past this coming winter which is when I really use it. Other than the night visitors, nothing spectacular going on in the garden – just chugging along looking great. I’ve lost some of the tomato seedlings but that’s expected. It’s just so hot and humid but if I wait a month to start the process, the risk of a freeze right at harvest time increases. It’s always a crap shoot which is why I plant so many different things – something always works. 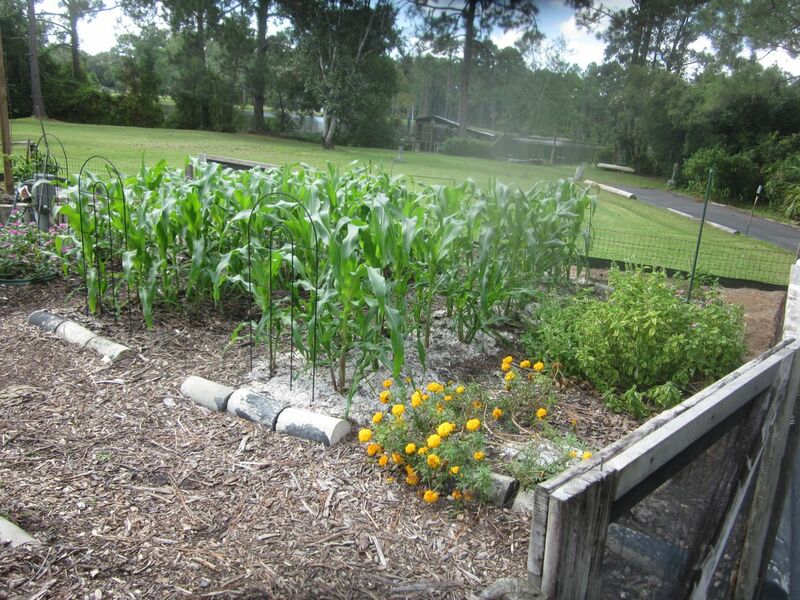 The corn in the picture is waist high and really healthy looking. I planted those seeds the first of August and the harvest is scheduled for the first of Nov. (assuming they stay vertical) and the deer leaves them alone. That white sand you see is what I’ve add to prop up the stalks.